Arranging wicker baskets in his modest concrete house, the mud-plastered room looks like a twigs store. Habibullah Lone, 65, calls the room a Karkhaan (Urdu word literally meaning the place where one works). He is among the last generation from his family to carry on the traditional wicker work business. Every Karkhaan in the Gundi Rehman (Ganderbal) and its adjoining villages are mud plastered. It retains heat so that workers, mostly aged males, can stay working for longer hours. These rooms usually have only one pair of small windows. Mud plastered rooms are considered better for people with a backache. The craft, locally know as Kanil Kaem, is believed to have been introduced by Europeans in early nineteenth century. It uses the twigs from willow as the main raw material. 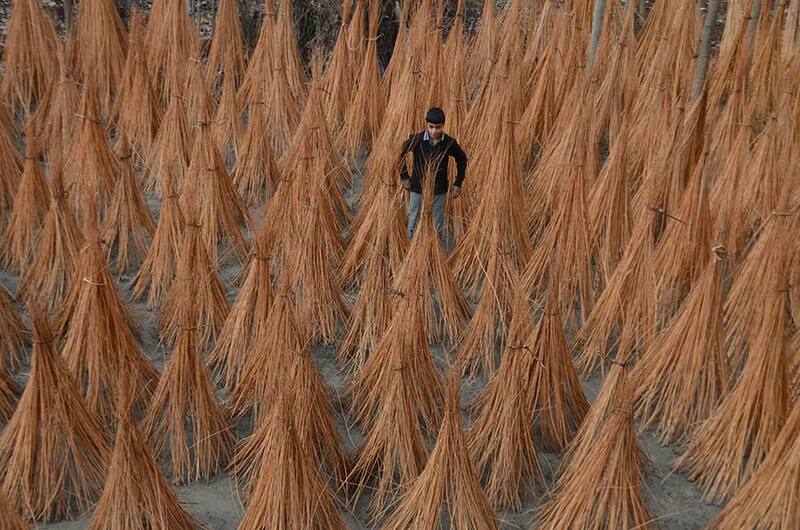 Kashmir has been growing willow traditionally on the river banks, swampy or wastelands and is considered a major intervention to stop soil erosion. Cultivated from saplings, once it sprouts, it is served and sown into the land to harvest its shoots every year. The sapling continues to produce an annual harvest until it is uprooted. “To plant a willow you simply cut a slip from another plant and stick it into the ground in spring, the willow will take root and grow into a tough little plant, at a rate of about 8 ft a year,” said Riyaz Ahmad, a willow worker. The subsequent process is prolonged and slightly complicated. 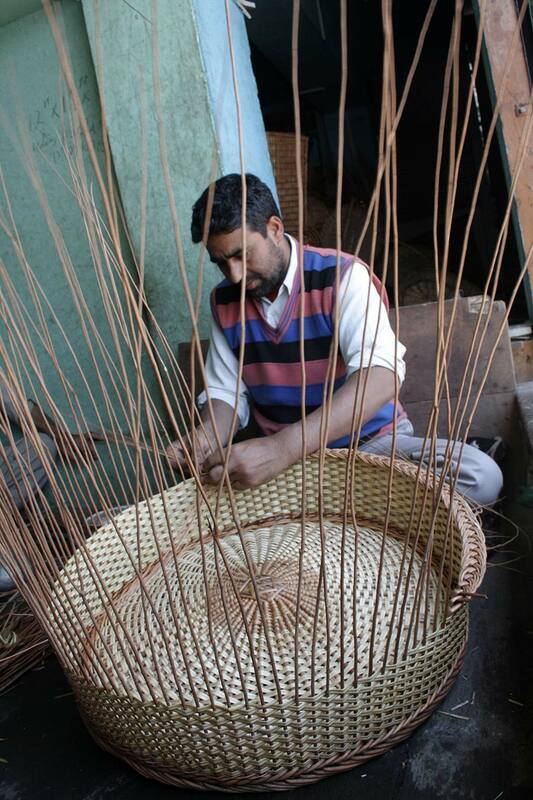 Ganderbal is the hub for willow wicker craft. It produces a lot of raw material from locally cultivated willow rushes and reeds. Villages like Harran, Shalla Bug, Tehlipora, Kachan, Gundi Rehman are the main centers for this craft. Wickerwork products include basket ducks, chairs, willow basket trays, baskets and many other things. Some of these items are exported, traditionally. Artisans allege the government is neither providing facilities nor comes to their rescue when they are facing the downslide in the market. They said that while Artisan Credit Card (ACC) is available across India to artisans, it is not for the wicker workers of Kashmir. ACC is a loan facility on which government pays most of the interest, 10 percent of the costs. This has created a situation that new generation is leaving the craft. They opt for white collar jobs and in most of the cases, simple manual labour. The latest decision of bringing handicraft sector under Goods and Services Tax (GST) has hit the already morbid sector hard. Worried artisans and traders insist that the sector has suffered heavily due to the new tax. Although the sector was exempted from Value Added Tax (VAT), the GST seeks 5 percent tax on every sale of handicraft item. Now the problem is not of five percent but the allied processing of it. They have to get into the system formally, have bank accounts, file returns, list their input costs which is quite laborious to the concerned. Officials have a different line. “ GST will not directly affect the artisans but yes it will indirectly leave an impact on this cottage industry,” Assistant Director Handicraft Ganderbal, Mushtaq Ahmad, said. The middlemen have already started decreasing the bying rates of the products. They tell us buyers are not paying the tax. They want it at old rates. Handicraft department, he said, has already intervened for various benefits to artisans.”Recently World Bank has approved a loan for setting up a project in Ganderbal where artisans will avail the various benefits free,” Ahmad said, insisting there are various schemes already in vogue. Apart from a loan up to one lakh rupees on10 percent interest subsidy, artisans can have life insurance cover at Rs 82 premium. In case of death, the insured person family will get Rs one lakh and if it is an accidental death, the outgo will double. All the registered artisans can avail a scholarship of Rs 1000, a month if their wards are studying in the ninth or tenth standard.